Atomic, yes, but open to all. 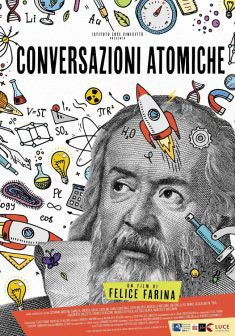 The author created a brilliant mixture of fascinating topics – such as general relativity and quantum mechanics – and comic moments, adopting an accessible language to show us a dialogic science, ready to make itself understood even by those who are just curious about it. Farina, accompanied by his camera operator Nicholas Di Valerio, explores the world of big questions, meeting researchers, professors and astronomers, snooping through old and new generation instruments. There is no lack of through backs with unedited footages about the history of research. Frascati National Laboratories are among the protagonists too, with some of their researchers strangely playing the role of “actors”. Starting from LNF, then moving to Gran Sasso National Laboratories, the director leads the audience on a journey through the fundamental questions of contemporary physics, discovering those who have chosen to devote their life to finding the answers.